Ummmm......yeah, so the leftovers from the Global Travelers Dinner Club went straight home with me (well, at least the sweets did) and as you know my favorite dish was the apple-stuffed crepes with dulce de leche. 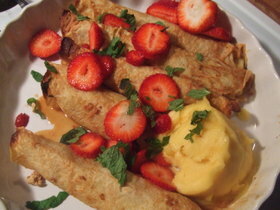 Well, last night, I pulled those little mamas out of the fridge, tossed them in the oven and got 'em all crispy and warm, threw on some passionfruit sorbet, sliced strawberries and some fresh mint and promptly had a feast. This was all after a lovely (very healthy) dinner at my new favorite sushi house, Cafe Blossom (I've always been a hearty eater, but since I started getting into Bikram Yoga--the 105 degree/hour and a half long class---I have been really chowin' down). This concoction was straight-up delicious and Colleen, the chica who made this dish from Argentina, had mentioned that making the dulce de leche was as easy as tossing sweetened condensed milk in the oven and baking it 'til it becomes caramelized. Though that is great to know...it's not so great to know for my sweet tooth. I'll just pretend like I never got that helpful hint~And, I will say, these were even better the next day. Last night was the first month of our new Global Traveler's Dinner Club where everyone brings a traditional dish from the chosen country (and the host provides the indigenous cocktail). What fun it all was to discover all the tastes of another country made by folks who've never cooked from there before. We chose Argentina as the first country and there were so many good things to eat (I personally OD'ed on apple stuffed crepes smothered in dulce de leche)~I made this crazy cabbage pudding with tomato sauce (Budin de Pepollo) that was really quite good--and the tomato sauce had cinnamon in it. Very interesting...I never would've put cinnamon in a sauce like that, but it made it smoky and sweet (right up my alley). 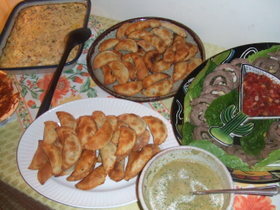 Other dishes in the lineup were a thick codfish stew, meat and veggie stuffed empenadas with salsa, tender flank steak pinwheels, a creamy swiss chard saute, and little cookies with dulce de leche. Everything was totally delish and what a perfect way to taste your way around the world---I chose August as my month to host and my country is India---which is perfect, because I have the perfect book to get inspiration from: Mangoes and Curry Leaves (a brilliant tomb detailing one couples culinary travels thru the sub-continent) and the perfect backyard to chill in. We also managed to round-up a few bags full of old shoes to send down to the Hurricane Katrina victims--awesome stuff all the way around.